Accompanied by Bob Hoban. 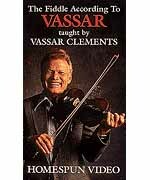 This great fiddle master demonstrates more than a dozen licks and their uses in several favorite tunes, as well as his trademark riffs, slides, chromatics, double- and triple-stops, slurs, boogie-woogie patterns and more. Songs: Lonesome Fiddle Blues - Orange Blossom Special - Good Woman's Love - Avalanche - and others. 90-MINUTE DVD - INCLUDES MUSIC - LEVEL 3/4.